A few weeks and then it is Christmas. Just in time, we got a few new geocoins. Amongst that the beautiful Heartbeat geocoin which you can use as a pendant. Part of the profit will go to the Swedish Heart-Lung Foundation. Size: 44 x 31 mm, 3mm thick with a small hole on the top, so that your can wear it as a pendant. For all Geocoin collectors and fans of Trabant. This Benchmark Geocoin is made in 3D antique bronze. On the front is the original design of Benchmark, on the back, a part of the Southern Ocean, around Antarica. The blue transculent makes the ocean view just pop. The three basics of caching are: "Eat, Sleep and Cache" This beautiful geocoin was inspired by our shirt and love for the outdoors. The front of the coin shows the Eat, Sleep, Cache logo while the back shows a beautiful camping scene. The back includes 11 different colors including 3 Transparent Enamel. Now available in a limited edition: antique silver. 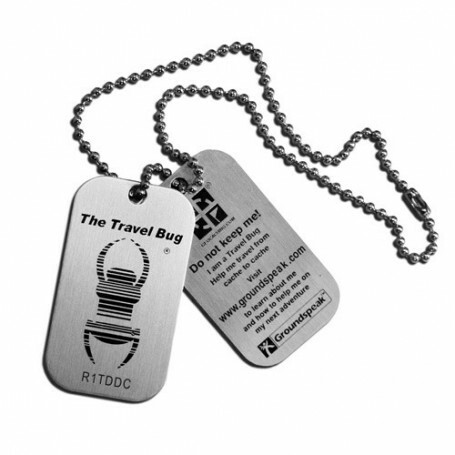 This coin serves as a fun reminder of one of the cardinal rules (er... guidelines) of Geocaching. Caches have to be spaced out and 528 ft (.1 miles) or 161 meters is the minimum distance you can place caches from each other. Now available in a limited edition: antique bronze. Dial up to your pain threshold for caching with this coin. The face features one way to set your threshold and the back features every possible comination of difficulty and terrain a cache could be. A look like a fine wrist watch with a great caching theme - this one is a must have for collectors and will be fun to send on the trail. Compact flashlight with both blue and UV light.